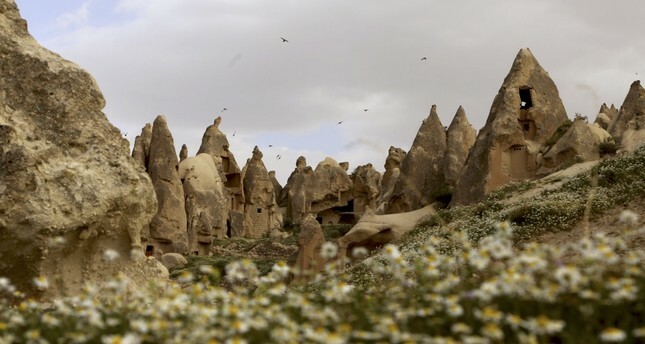 The Cappadocia Museum will be among the fairy chimneys in an area close to Avanos district. The Cappadocia region is one of the most important tourism centers in Turkey, and a new one-of-a-kind carved-rock, natural underground museum plans to add another element to this already spectacular region. Cappadocia Museum, located near the region's famous fairy chimneys in the district of Avanos, will feature a floor carved from tuff, a rock comprised of volcanic ash that rained down in eruptions of Mount Erciyes, Mount Hasan and Güllü Mountain one million years ago. The construction of the museum kicked off in January after being put out to tender by the Culture and Tourism Ministry. The venue will highlight Anatolian history through exhibitions of ethnographic and thematic works set up in its natural, underground setting. The museum will have an overall organic feel. Its roof covered in endemic plants hovers over the structure's 50,000-square-meter open area and 7,000-square-meter closed area. There will also be a versatile conference hall, documentary screening rooms, play workshops for children and a research center in addition to the 1,500-square-meter showroom. In the museum, which has a natural environment on its roof, endemic plants can grow along a 50,000-square-meter open area and 7,000-square-meter closed area. The museum will be located only 15 minutes from the most-visited centers of the region, such as Göreme Open-Air Museum, Paşabağı, the Zelve Archaeological Site and Uçhisar Castle. Nevşehir Museum Director and Turkey Representative of the European Museum of the Year Award (EMYA) Murat Gülyaz told Anadolu Agency (AA) that the museum will contribute to Cappadocia, an area home to a unique culture, valleys covered with fairy chimneys, underground cities, and cultural and religious heritage. While discussing the ongoing intricate carving process for the new museum, Gülyaz explained that it will be among the most prestigious museums in Turkey and one of the most unique in the world. He stressed that the museum will add an attraction to Cappadocia after construction is complete. "Our goal is to open for visitors by 2019. It will be one of the most important museums in the world. It is 100 percent natural and built underground. It will be the only museum of its kind," the museum director continued. Stating there will be archaeological and thematic displays from various periods and fossils dating back millions of years on display, Gülyaz reported that the museum has natural temperature control thanks to its indigenous rock, meaning energy will not be wasted keeping it cool in summer months or to warm in the winter. Implying the museum will be one of the most prestigious museums in the world, he said: "It is an eco-museum that is in touch with nature. Endemic plants will grow on its roof and no iron or cement were used inside. It is totally natural, and the only example of such a museum in the world. The indoor temperature will be 21 degrees Celsius year-round because the volcanic tuff provides natural insulation. The museum will also have a display of graves and remains. Burial rituals starting from the prehistoric ages to the Ottoman Empire's last years will be exhibited with archaeological findings and thematic presentations. There will also be a natural history section focusing on Cappadocia and featuring displays of fossils dating back 12 million years." He also said their target audience will be children, who he is sure will enjoy the museum very much. "We will help children learn to love nature and archaeology. One of the most important features of the museum is the endemic plants on its roof. They kind of transform it into an eco-museum," he added. He also said he visits many museums around the world every year as a representative of the EMYA but pointed out that he has not seen one like the Cappadocia Museum to date.